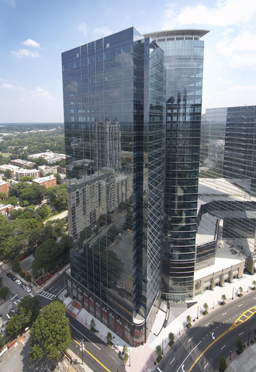 The 1075 Peachtree city block is home to an interconnected project with the following components and features: 700,000 SF of Class A Office space, 414 Key Loews Full Service Hotel with 50,000 GSF conference center, 19,000 SF state of the art fitness center and spa, 52 Luxury Residences, 35,000 SF of street level retail, and a 1700 car parking deck. All of these components sit on an irregular shaped 3.2 acre parcel of land. 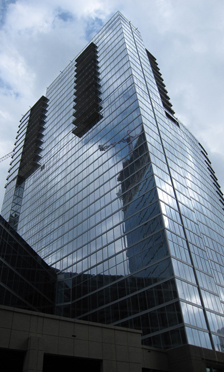 The project contains over 2,000,000 square feet and 36 elevators. The project massing is divided into two towers (office in one and hotel/condo in the other). 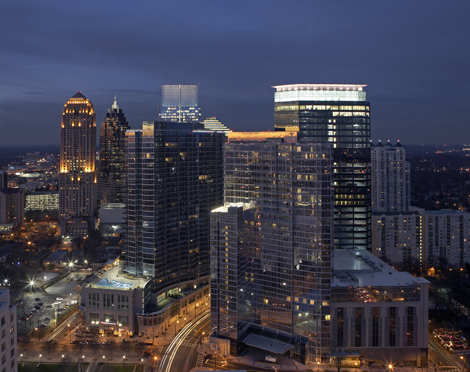 This two tower concept was developed to help preserve the views of the 1010 Midtown project located across the street. The two towers are connected at the base by the retail and the parking components. Each major vertical component has its own identity and own lobby.